Easily organize your kids ﻿﻿school﻿﻿ memories now and for years to come. Are you tired of your kids school memorabilia piling up everywhere (because you have no idea what to do with it)? You know you need to preserve your kids' school memories, but what does that look like for real moms with crazy-busy lives? Even if you're short on time you can quickly and easily create meaningful school memory boxes for your children! The My Memory Box system is the perfect solution for busy moms looking to preserve their kids' precious school memorabilia--quickly, easily and on budget. 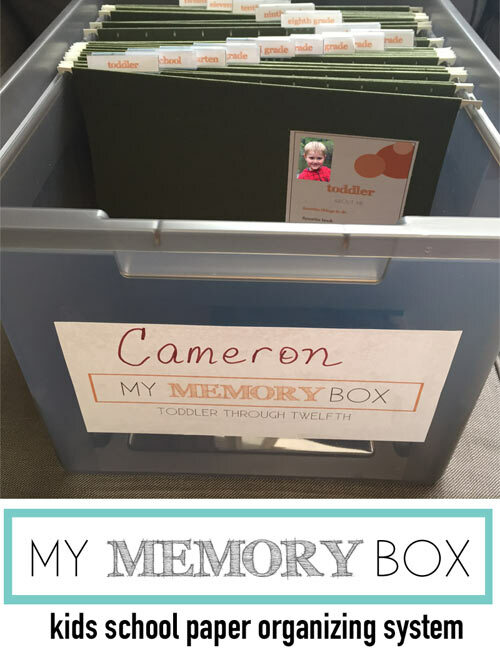 With My Memory Box, you can keep your kids' precious artwork and school memorabilia from toddler to 12th grade organized (no more crazy piles!) and preserved for years to come in one central place without tons of work, effort (and money!) year after year. You'll get a copy of each item in four different colors--orange, purple, blue and green--so you can create a personalized box for each child. Put a School Memory Box Together in a Matter of Minutes with My Memory Box. Set up the My Memory Box system once, and simply add school memorabilia through the years. Done and done! Create a priceless keepsake of your child's school years--easily and painlessly--with My Memory Box. Set up the system in minutes to create a central location for your child's school memories--year after year. No more crazy paper piles. No more lost precious memorabilia. No need to create elaborate scrapbooks. No more mom guilt about what to do with your kids' school memorabilia. Instead, you'll be able to create a lasting keepsake of your child's school years--effortlessly. This simple system is easy to set up and basically runs itself once it’s in place! One easily organized, central location for ALL your children’s artwork. The My Memory Box system has one file folder for each child’s school year from toddler to 12th grade. Papers are organized as they come into your house (no more piles!). Organize artwork and papers as you go through the school year. No big pile of papers to sort at the end of the year! No more losing awards, artwork or other special papers. Put a picture of your child on the front of each year’s file folder (there’s even a space for them to sign their name each year so you can track their signature!). 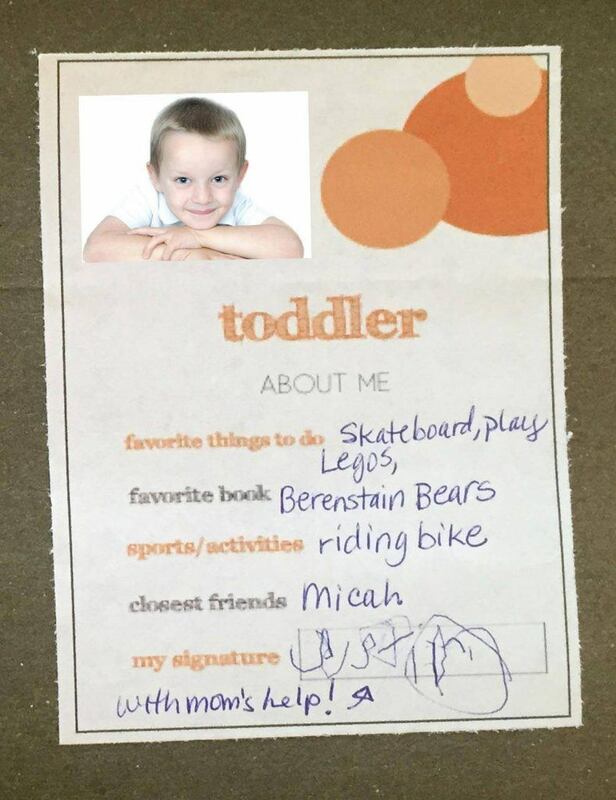 Record fun facts, such as your child's favorite book, best friend’s name—there's even a place for them to write their signature! 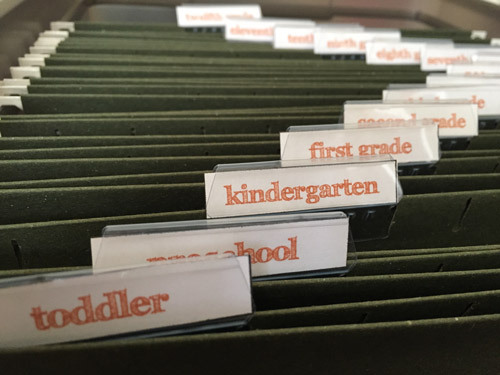 Place your child’s school year photo on the top left of each year’s file folder label (optional). Create a customized keepsake for your child’s school experience—all in one place! Just download, print and assemble. Fun fonts and clean designs give this organizing system a timeless look. Choose from orange, purple, blue and green. All four colors are included in the download, so you can download a different color for each child! 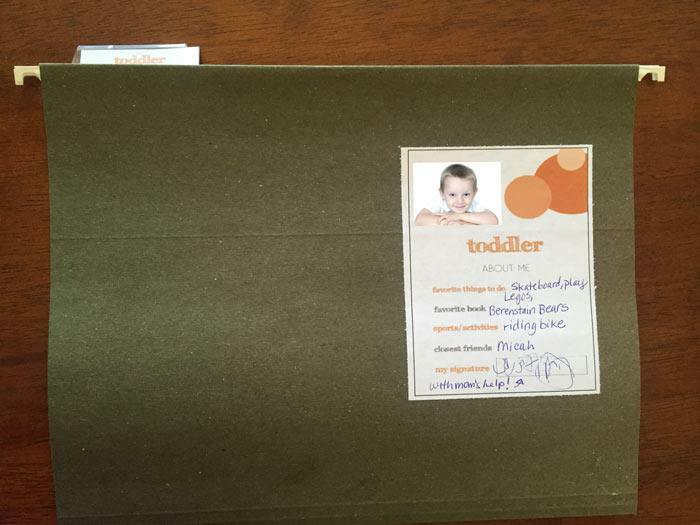 Hundreds of moms have downloaded My Memory Box and love how it keeps their kids' school papers organized! Couldn’t I just create a traditional scrapbook for my kids each year? Absolutely. You could totally do that. If you had the time to create all those pages. Some moms do, and that’s totally cool. For me, I have four children, we homeschool part-time and I’m a full-time writer, so that is just impossible for me. Actually, I quite enjoy scrapbooking and did so for many years (it was my stress relief when my kids were really little). But even when I was able to find time to scrapbook, I found that it took me so long to finish any books because I’m a total perfectionist and want perfectly designed pages (which meant that a lot less scrapbooks were completed than what I’d like to admit!). Also, in terms of school memory items, paper scrapbooks just can’t accommodate oversized and bulky school memorabilia items like the My Memory Box system can. The My Memory Box system just works and makes the whole process much easier. That's why I think it's been such a great solution for busy moms. I’ve heard that some people have a simple binder with page protectors to store their kids school memorabilia. Why not just do this? First, I would have to buy a three-ring binder for each child each year. That equals a ton of binders to keep on hand and store! I’d rather have one central location without lots of loose pieces. Plus, who wants to have to create/buy new binders each year? Second, I would have to buy a heck of a lot of page protectors (and always have them on hand) because my kids create a ton of stuff! Third, a lot of my kids stuff just doesn’t fit well in a page protector. Consider, for example, awards, ribbons and oversized art projects. Where would those go in a binder? Even if you could make it fit in a page protector, it would make weird lumps and bend everything else out of shape, etc. Nah, the My Memory Box system (which uses a plastic tote with dividers for each year) makes way more sense to me. Why not just create a digital scrapbook for my kids memories? Isn’t that fast and easy too? Of course you can do this, but I really feel like digital scrapbooks only tell one side of the story--the pictures. And they still don’t answer the issue of what to do with all the adorable coloring pages, awards/ribbons, oversized art projects, etc. 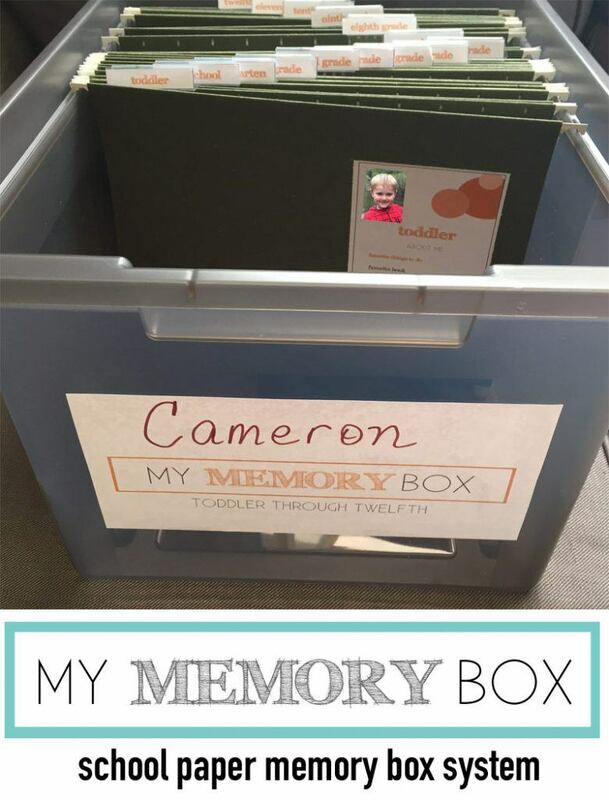 My Memory Box is the perfect solution because it allows you to easily establish an ongoing, central location for your children’s memories that actually showcases their stuff they created. You get the true essence of what they created. Plus, it can really add up to create a digital scrapbook year after year! With My Memory Box, you only spend $19.99 once for your entire family to have a well-organized, adorable school memory box system. Yes, you do have to also purchase a plastic bin and a set of file folders for each child (about $20-25/child, depending on the quantity of supplies you buy), but that’s it—forever! Once the system is established, you’re done! There are no additional required supplies to purchase in future years. No digital books to create and purchase each year (for each child!). Which also means way less time and effort for mom! Woo hoo! Ok, so I can see that the My Memory Box system really does make sense! Tell me exactly what the My Memory Box download contains. You’ll get a copy of all of these items in four different colors (purple, orange, blue and green). Does this purchase include the plastic file box and file folders? No, this is a digital download. You will receive all of the digital files to print off the labels and tabs, and the instructions on how to put the system together. The files also include links to the recommended file folders and plastic file box so that you can purchase these separately on Amazon. Do I need to purchase one My Memory Box download for each of my kids? Nope! Each download of the My Memory Box system contains 4 different colors, so you only need to purchase one copy for your entire family. What school grades are included in the My Memory Box system? My Memory Box system includes supplies to store memorabilia from the toddler years through twelfth grade. Not a problem! I’d love to answer any questions you have about My Memory Box! Feel free to email me, My Memory Box creator Alicia Michelle, directly at alicia@yourvibrantfamily.com. Why put off buying My Memory Box when it will bring organization to your home and it will give you a beautiful keepsake for your child for years to come (with minimal effort from you)? Get the My Memory Box printable download right now for only $19.99! You don't have to deal with the messy piles of your kids' precious artwork and school papers anymore. 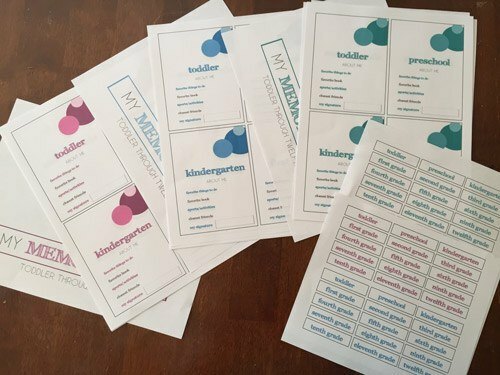 There won't be any more mom guilt about "what to do with all those adorable papers" because​ you'll know exactly what to do with them! Imagine how incredible it would be to have one central location for all your kids school memorabilia, and to only have to create that system once! Get organized (and stay that way!) with the My Memory Box system. Remember: You get four colors of the My Memory Box system in each download! You only need to buy one download for your entire family! What an amazing deal! Why put it off? Start preserving your kids' school memories easily and effortlessly today!